A 300-pound security robot at at the Stanford Shopping Center knocked down and ran over a 16-month-old boy. The parents of the injured boy are understandably pissed, claiming the autonomous machine is dangerous. The toddler, named Harwin, was allegedly assaulted by the shopping mall’s security robot, which stands five-feet-tall and weighs 300 pounds. Harwin didn’t suffer any serious injuries, but the robot ran over his right foot causing it to swell. He also got a nasty scrape on his leg from the incident. The parents said the machine is dangerous, and they’re hoping to get the word out to prevent others from getting hurt. The robot is developed by Knightscope, a Silicon Valley startup located in Mountain View (the robot happens to bear the name of its manufacturer). 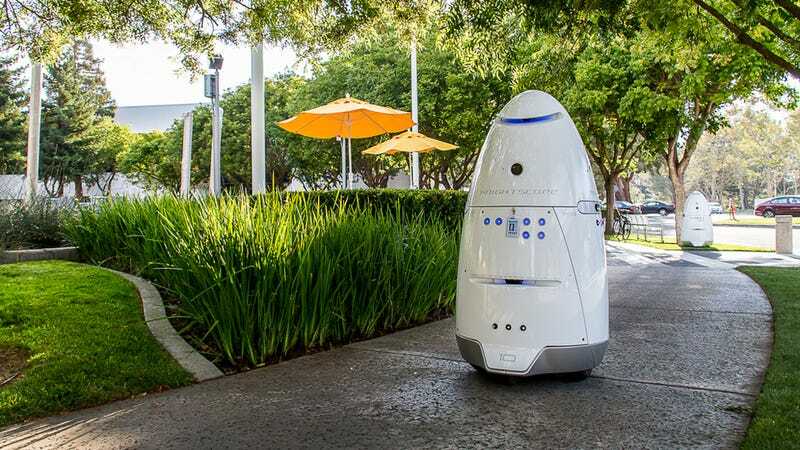 The current version, the K5 beta prototype, is a fully autonomous robot that’s used to deter and detect crime. To that end, it’s equipped with a battery of instruments, including a video camera, thermal imaging sensors, a laser range finder, radar, air quality sensors, and a microphone. When the Knightscope K5 senses trouble, it alerts local authorities—though it didn’t seem particularly concerned when it plowed into the toddler earlier this week. Little is known about the incident, but the robot’s sensors didn’t seem to detect Harwin—and that’s obviously a problem. This Knightscope K5 unit, which began its duties at the mall last year, will undoubtedly come into contact with other pint-sized shoppers. Gizmodo reached out to Knightscope for comment, but have yet to receive a response. We’ll update this post if we hear back. Hearing a report that one of our machines may have injured someone is absolutely horrifying. Many of our team members are parents and understand the importance of protecting our children at all costs. To date, Knightscope machines have run for more than 35,000 hours and traveled over 25,000 miles, and this is the first report of any such incident. Similar to every other technology company in Silicon Valley, Knightscope strives to make improvements on a daily basis. Our core mission is to ensure public safety, and we are taking this report very seriously. We have reached out to the mother to invite her to our office to meet the entire Knightscope team. We would all like to have the opportunity to apologize to her and her child directly. At this time, we have not yet heard back from her.